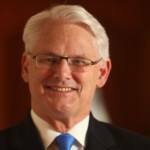 Gordon Campbell is the former Premier of British Columbia (2001-2011) and former Leader of the BC Liberal Party. He is well known globally for his progressive leadership in implementing a revenue-neutral provincial carbon tax in 2008 that led to significant reductions in carbon emissions. Most recently, Gordon was the Canadian High Commissioner to the United Kingdom (2011-2016) and Canada’s Representative to the Ismaili Imamat (2014-2016). Prior to his role as Premier, Gordon was the Mayor of Vancouver (1986-1993). He holds an MBA from Simon Fraser University. 1- Canada needs to encourage innovation in the public sphere so that we have future-ready institutions. We must also empower our provinces and cities to identify, adopt and adapt the initiatives that will enable them to play their crucial role in achieving our national goals and commitments. 2- The environmental agenda is a huge opportunity for businesses, because it is an incentive to generate new levels of productivity and use our resource base more efficiently. But we must recognize that this transition must be a profitable one to be sustainable economically, and governments’ policy agendas must reflect this. 3- While NAFTA negotiations have been long and slow, Canada’s CETA and TPP agreements are springboards for our future economy since they will grow our economy, encourage innovation and allow Canadians access to enormous markets. The Canadian Government needs to allow for more autonomy at all levels of public endeavour if we are to truly embrace an innovation agenda. For example, business and provinces should decide how they would meet national climate change standards. Moreover, students should have a voice in the transformation of the Canadian education system. Is Canada doing enough to meet its Paris Agreement goals? Canada should be leading the world with regards to climate. I am in favour of a revenue-neutral carbon tax, not just a simple carbon tax. In British Columbia, we adopted a multifaceted revenue-neutral carbon tax, which was a reasonable approach. If governments were interested in the climate and not in a new revenue source dressed up in a new name, they would make the carbon tax revenue neutral. That is an environmental initiative. But dealing with climate requires more than a revenue neutral tax. It requires a comprehensive plan for new actions and each of us can contribute with our personal behaviours and choices. For example, we can change the way we plan Canadian cities dramatically to make them more liveable, integrated and healthy in the future. We have the talent, the knowledge and the technology to do that, but we just don’t. Unless the public authorities make a concerted effort to bring an exciting atmosphere to the urban center, we are going to continue to drive dependence on automobiles. Integration, not separation, is the key to the city of the 21stcentury. There is more government momentum on sustainability today than probably ever before. How can the public sector accelerate this momentum and what can the private sector do to support it? The Federal Government has prioritized environmental stewardship. But we should not lose sight of the role of provinces in taking concrete action. For example, British Columbia has pursued its environmental goals on multiple fronts. Provinces can learn by analyzing other provinces’ successful initiatives and then adopt them to their specific circumstances. That is how we will meet overall national objectives. For policy making at the national level, the first step is to set our national objectives and the second is to avoid wishful thinking and wilful blindness. It is wilful blindness to think that the world’s energy demands are not going to continue to grow. Canada can provide cleaner energy to the rest of the world; this is a global economic advantage and a contribution to geopolitical stability. When the world uses Canadian energy, we are all be better off. A lot of companies are taking steps in alternative energy and many other areas that will prove to be extremely positive in the long-term. The environmental agenda is a huge opportunity for businesses, because it is an incentive to generate new levels of productivity and use our resource base more efficiently. Having said that, we have to remember that the end goal of the private sector is profit – a return on investments. So, Canada cannot force businesses to forego profits and incur major losses in order to meet its policy agenda. The government has to create a positive environment for businesses to engage in dialogue on the environment. When business groups come together and network around the positive actions they have taken on sustainability, it creates genuine interest in leading change. Canada should encourage such positive steps and recognize them since businesses are driven by public recognition and brand value. How can Canadian cities become more sustainable? Cities are a critical part of every country’s economic and environmental future. If I remember correctly, more than 50% of the world’s population finally moved into urban areas in 2008. This figure will continue to grow. Having said that, we still have a lot to learn about building cities. A good place to start would be to equip cities with the tools they need to make choices autonomously. We need to overcome the historic drive to separate activities in cities and integrate them instead. When it comes to the environmental sustainability of our cities, we need to move away from the line of thought that encourages sprawl. We also need to expeditiously invest more in transit and create liveable neighbourhoods around transit stops. We can no longer take decades to make long-term transit investments. Urban Canadian neighbourhoods should be attractive places to live with diversity in housing and commercial forms, as well as in the income of their residents. We need to give them the tools they need. It is not just new money that they need; they need new thinking as well. How do the NAFTA and Brexit negotiations threaten Canada’s economic future? Canadians generally understand that we are a trading nation that needs open and fair trade with the world. Canada’s Comprehensive Economic Trade Agreement (CETA) with Europe is a huge springboard into our economic future. It will grow our economy, encourage innovation and allow Canadians access to an enormous market. The new Comprehensive and Progressive Agreement for Trans-Pacific Partnership (CPTPP) agreement will also open up opportunities for Canada. On the other hand, NAFTA is going to be a lot of hard work to improve but Canada has an excellent team working on it. Moreover, some NAFTA changes will be positive for Canada’s economy. The world has changed dramatically since NAFTA was first finalized in the early 90s and certainly since the Canada-US Trade Agreement. There are aspects of the agreement that need to be updated for the benefit of all the signatories. For example, intellectual property protection has transformed over the years and will be updated through the NAFTA negotiations. So, we do have significant common ground to build on. Coming to the UK, although I did not personally favour Brexit, it is an opportunity for Canada to strengthen its trading relationship with the UK, which is one of our most important trading partners. We often underestimate Canada’s reputation. When I got to the UK in 2011, Canada had a reputation for being prudent financially and was often given credit for recovering from the 2008/9 financial crisis relatively unscathed because of our economic leadership at the time. I believe Canada has to do be much better and more aggressive at telling its own story. How can Canada better prepare its youth for jobs that do not exist today? Education is a critical and essential component of everything that we do. It is the best health promotion program and the best economic development engine we have ever come up with. In today’s globalized world, Canada needs to think of education from a global perspective. Our students should get the opportunity to explore not only Canada, but also the world. Secondly, our educational institutions must allow for more student-driven agendas because the future will be shaped by and for the young. Working with experience is critical but we need to see the world through new eyes to capture its possibilities. Education, like the environment, is easy to talk about but difficult to change and take action on. We know today that learning starts from the day we enter the world. Our goal should be to nurture young people’s learning from that day they enter the world and to maintain a life of learning until they day we leave. Technological innovation is the most talked about form of innovation at this time, but social and institutional innovation are arguably even more important. In fact I do not believe we can reach the full potential of one without the other two. Innovation in our education and health systems, in how we understand the environment and in how urban development can assist us in meeting our goals, will have a long-term impact on the lives of Canadians.